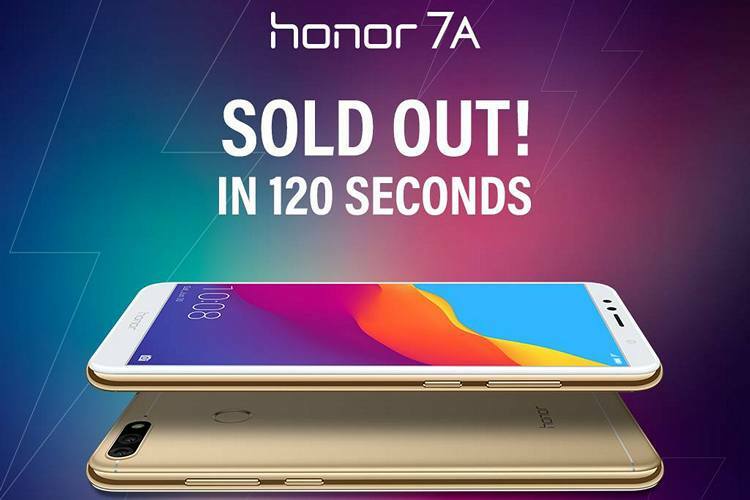 Huawei’s Honor 7A smartphone was sold out is just 120 seconds on its first flash sale earlier today, the company has announced. Launched in India last week alongside the Honor 7C, the Honor 7A is a lower mid-range smartphone that is available exclusively on Flipkart, and is priced at Rs. 8,999 for the 3GB/32GB model. The next flash sale for the device is scheduled for June 5. It competes with the Xiaomi Redmi 5, Redmi Note 5 and the Asus Zenfone Max Pro in the Indian market, as well as its Honor 7C sibling, which is priced just a little higher. In a press statement, P. Sanjeev, Vice President, Sales, Huawei Consumer Business Group, said that the company is pleased with the ‘phenomenal response’ to the Honor 7A from customers in the country. According to him, “This reaffirms our strong position in the Indian market and gives us the confidence to continue launching top best-in-class products for our consumers in the time to come”. The Honor 7A features a 5.7-inch HD+ (1440×720) IPS LCD display. It is powered by the Snapdragon 430 SoC, and comes with 3GB of RAM and 32GB of internal storage. It sports a rear-facing dual-camera (13MP+2MP ) setup that comes with AI-based features. The smartphone runs Android 8.0 Oreo with EMUI 8.0 on top. The device is priced at Rs. 8,999, and is being sold exclusively via Flipkart in India.